In this blogpost, I thought I would look to capture the essence of my CORE eFellow inquiry. It’s fitting for me to do this now, as my research proper will get underway on Wednesday, with the first ever intake of postgrads into the Wellington branch of The Mind Lab by Unitec starting (squee!). I’m asking for help from the postgrads to inquire into my own teaching practice. I would describe this as a Design Thinking pedagogy. On a really small scale, I want to cut any direct instruction time by me to 15 minutes. On a much larger, more significant scale, I want to ensure that I promote discussions around an overarching question or provocation, enable the playing with ideas, and a chance to reflect on education in New Zealand on a systemic, but also a personal classroom, level. I want to do this in a respectful, empathetic way. I don’t want to make assumptions about why teachers have courageously chosen to make this impressive time commitment to their professional learning. I’m genuinely interested to hear about what’s happening in the classrooms around the greater Wellington region, and the applied learnings that might arise out of participation in the Certificate of Digital and Collaborative Learning. How can I use design thinking principles to promote active change in a professional learning context? How can my use of design thinking shift a teacher’s ability to transform their mindset/learning and thus their classroom? What stories of change can I hear from teachers who are inspired by a design thinking mindset? I’m really looking forward to engaging in this research with the help and support of the Wellington postgrads. Any feedback, thoughts or suggestions are gratefully received. An information sheet about my research is available by clicking here. 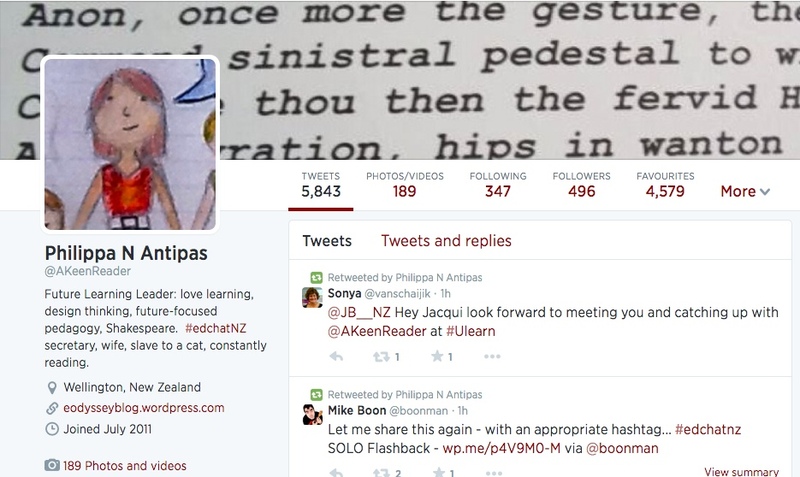 Click on the badge to see my TeachMeetNZ page. Ever grateful for the opportunities that come my way, this weekend I shared a presentation through TeachMeetNZ to the CLESOL conference. I really enjoyed presenting in this way: the combination of speaking to your slides seemed to suit my delivery style well. I learnt a few more ‘techy’ tools along the way, such as how to embed my presentations, set them to auto-advance, and how to share my screen during a Google Hangout. I really enjoyed working more with the wonderful Sonya van Schaijik, who also works on the #edchatNZ steering committee with me. Getting to know a few more connected educators, my co-presenters, was also a bonus. It was fascinating to hear all the different topics people spoke to, but also some of the common themes of really knowing your learners well in order to best meet them and their needs with empathy, understanding and support. I’ve been ‘flipping’ my language lessons for six months now – it’s roughly about one lesson every two to three weeks. I find using TED-Ed straightforward, and although I can sometimes spend a while to find exactly the ‘right’ video to choose, making the lessons themselves in this way, is fairly quick and easy. The students seem to enjoy completing their TED-Ed homework, and I remain convinced that the three minute videos I choose will always be more fun and engaging than drill and practise out of a workbook. One of the aspects I really like about flipping my language lessons is that it gives me a much better understanding of the students’ individual strengths and weaknesses. One example in particular is one of my very bright, articulate students, who did poorly with a lesson on verbs. Without the data provided from TED-Ed, and flipping this activity, I would have assumed her to be confident with this material. It is this ability to personalise learning more that I see as an important benefit to flipping lessons. And, conversely, it’s also where I can see I need to do some more work. Because the questions I tend to set for the students to complete are largely multi-choice, the spread of data I get is really insufficient to separate my class into more than two groups in an informed fashion. Thus, the flipped lessons I have prepared these holidays are less reliant on multi-choice, and I’m hoping this in turn generates a greater spread of students. I would like to be able to put them into at least three groups, each with their own tasks to complete in the classroom, so that I can target their needs to a greater extent. I’ve also just taken my first baby steps to making my own videos! I had a play with the ‘Educreations‘ app on my iPad and I’ve made a revision lesson on apostrophes. It was surprisingly quick and easy to do. However, I really want a tool that means I can upload my videos (gulp) to YouTube so that I can incorporate them into TED-Ed. I think the ‘Show Me‘ app will allow me to do this, but I’m open to other suggestions if you have them! 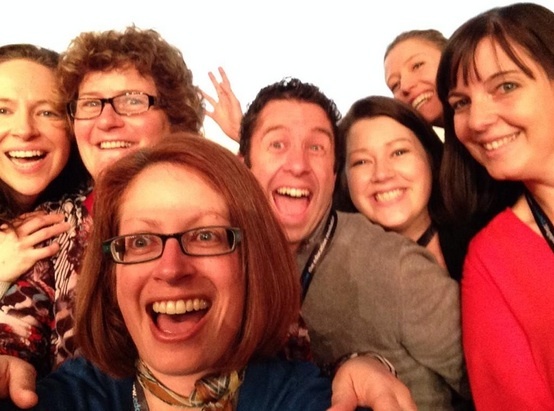 Being a connected educator means great opportunities come your way – these are to be embraced. I recommend presenting through TeachMeetNZ or its equivalent to you – supporting the professional learning of others is a neat experience. Reflecting on my ongoing inquiry has shown me that flipping lessons has much potential – but I can do more, and I have already taken some steps towards doing so. A common denominator between the subject of my presentation and being involved with TeachMeetNZ: rewindable learning! Technology really does have the power to boost our learning experiences. I really can’t thank those teachers enough who are not only prepared to try something new, perhaps out of their comfort zone, but were prepared to make their attempts public. I think this is awesome role-modelling and shows a real growth mindset. So proud! Hmmm perhaps this should have been my very first blog post, but better late than never, right?! I thought I’d just share a little bit of my journey – how I got to be in this metaphorical boat, sailing uncharted seas where the maps available may only warn ‘here be dragons’. It was when I found myself actively applying for non-teaching jobs (a massive wrench for someone who always wanted to teach) that I realised something just wasn’t adding up. While still applying for jobs, I started listening to myself. What messages was I relaying about my days at work? I always had a funny or warm anecdote about something that happened in class. I really like my colleagues. I really didn’t find satisfying the constant war on how best to spend my time. The hierarchy went: stuff with parents; stuff that affected colleagues; senior marking; junior marking; planning lessons; department strategic stuff. Very rarely did that ranked list lead me to do the things that I felt would make a difference. Something needed to change – but the teaching wasn’t actually it. In amongst this, it was announced that the school was going BYOD. Even me, with a severely limited understanding of what this meant in real terms, could see that this required a massive shift. What was the school doing about this (in case I don’t make this point later on – behind the scenes there was lots of really good thinking going on, I was just unaware of it at the time) to prepare staff? I could spy an opportunity. Land ahoy?! I presented myself as a ‘willing skeptic’ – I could write a blog, and present some ideas to staff about how to teach ‘BYOD’. I had some ideas about the 3Cs of creativity, communication and critical thinking. I convinced the principal. Job mine. Go to ULearn. Bam! I was suddenly adrift on an ocean of amazing ideas and opportunities – uncharted yes, but exciting in its very openness. Overnight (OK over the three days of the conference) I was converted – no longer ‘willing skeptic’ (how I cringe – who would go for that idea anyway?!) but raving zealot! So, no longer HOD English, but Future Learning Leader. The seas remain uncharted, but the way forward is becoming less mirage-like. I will co-lead staff learning around the WHY of e-learning/BYOD with a strong emphasis on future learning principles and strategies. I will not jump up with a new app every day. I will work alongside departments to follow through an inquiry process into what they’re interested, and what might work technology-wise to support student needs for them as 21st century citizens. I am no expert. I am but a learner, and hopefully we can all work together to learn more. Lifejacket anyone? Overall, I have to say my head is full and that I have a lot of thinking to do. Luckily, I like thinking! providing enabling tools and infrastructure. Without all four of these things, meaningful, sustainable change is not possible. And these four must be linked to future-oriented learning. That teachers must be helped to ‘unpack’ their current classroom practice, and the philosophical ideas behind these (e.g. why do we have assemblies – what learning comes out of these? e.g. what is the purpose of teaching English – what is the use of it in the ‘real world’?). If teachers are encouraged and supported to think in this way, then they are likely to recognise that there is a need – a pressing, genuine need – to do things differently (p. 62). That there are a lot of things that almost need to happen altogether – the strategies above, the engagement with the six themes of the report…and that’s massive. And maybe even a little overwhelming. But the important things usually are! That while essentially systemic transformation is needed, there are some steps we can begin to make right now towards the big picture. And that these steps are beautifully supported by the teaching as inquiry model of the NZC. We (students and teachers) are all learners, and all want to be life-long learners. I’m intrigued by the idea of ‘diversity’, which, as the report rightly captures, has been dominated in New Zealand schools by definitions of equity, or reducing disparity between different ethnic, in particular, groups. The report doesn’t downplay this approach, but rather, I think, shifts the focus from a negative to a positive perspective, calling for ways in which differences are seen as valued as they allow for ideas and problems to be seen in different lights, from different points of view. Overall, the concept of educating for diversity, I think is key. We must be able to engage with “people from cultural, religious and/or linguistic backgrounds or world views that are very different” from our own (p. 25), and we must be able to engage with a diversity of ideas (p. 25). I love this, and find it sits comfortably with my personal values and beliefs. Theme 3 is centred around shifting the concept of knowledge from one of knowledge as “content or ‘stuff'” to “something that does stuff” (p. 31). I think this is a huge challenge for secondary school teachers, in particular, whose core business has been imparting knowledge – filling the empty vessel analogy. The idea of knowledge as a verb, or that “knowledge is about creating knowledge and using knowledge” (p. 32) may be comfortable in theory, but to put into practice is less straight-forward and clear-cut. This is where inquiry-based learning, learning how to learn, and learning how to work with ideas and people, seems to me to come into play. Working in a cross-curricula fashion in order to learn transferable skills will become important. The fourth theme, focused on the shifting or rethinking of teacher and student roles, I’m gratified to see, is something I’ve considered already on this blog here. I actually really like that this entire report seems only to use the word ‘learner’. I think we should remember that this applies equally to ‘students’ and ‘teachers’ as we all seek to embrace learning about, in, and through a ‘future-oriented’ lens. Indeed, this feeds well into the fifth theme of continuous learning. The NZC speaks of creating ‘life-long learners’, and many schools have adopted this into their vision for their students. However, equally, teachers must see themselves as ‘life-long learners’ – and not just in terms of their specific knowledge, or learning, area, but of pedagogy as well. “21st century teachers need to be able to think about knowledge as a tool to do things with” (p. 46). This strikes me as being akin to the extended abstract end of the SOLO taxonomy that Marsden has been working with for a number of years. Teachers, with their subject-specific expertise need themselves to be able to think in a meta-cognitive kind of way about their subject and the ways in which the knowledge can be accessed, categorised, and linked. This (along with the previous blog post) form my reflection on the six themes outlined. There’s still a wee bit more to go, so bear with me as I explore the final ten pages…! The best summary of the themes and strands I’ve been observing as I’ve researched. Claire Amos has done it again! We will also therefore need future-focused leadership, which ultimately is change leadership. The teaching as inquiry model of the New Zealand Curriculum is an effective model of change management. Flip my language teaching as much as possible – especially the content for junior common tests. Get onto TED-Ed, and organise flipped lessons around punctuation, grammar, figurative language learning. Choose the dedicated language lesson once I know my timetable so that there is a day’s gap – time for me to see which students have grasped the concepts, and which haven’t so that I can target individual student needs best. No reason why seniors can’t be flipped like this too, especially around content revision for Unfamiliar Texts teaching. Analyse the Marsden vision statements to formulate some key phrases. This will help set an overall vision to measure new ideas and strategies against. I’ve collected some from other schools which will help with the phrasing. Read and research fully future learning principles so that I can articulate them clearly and succinctly to staff. This will serve as ‘double duty’ – on a micro level for planning my class programmes, and on a macro level to help me formulate a ‘teaching as inquiry’ for my position as Future Learning Leader. I will also sign up to the Virtual Learning Network to help me access research, help, advice, guidance – other schools’ stories as they have ventured into these uncharted territories! Love Claire Amos’ talk – e-learning facilitator (actually future learning facilitator) is the role I want to carve for myself at Marsden. I also liked the questions posed by Mary Anne Mills. Read, read, and read some more. Follow up on links, surf web, watch TED talks. Nut out teaching as inquiry – what do I actually want to achieve in a classroom next year? Need to realise/keep in mind my context. Some teachers reluctant. Work on this level. Can’t expect immediate and whole-hearted buy in. Model my own teacher inquiry process. Blog and regular sharing. Don’t bombard with a gazillion websites/tools. Keep reinforcing key principles. Link to Marsden context and NZC. If technology is just a tool to help us achieve future learning goals, then be sure to offer strategies that aren’t technology related! Possibly build on techniques that we already/currently use. Survey staff mid-year to gauge understanding of future learning principles. Must be able to articulate why the need to shift. Keep a running record of requests – play with making videos/flipped learning to start to build library of ‘go to’ tools. Students could also help create these. Could make videos of cool things already happening in classrooms at Marsden, eg flipped learning. Make experts of others. Find out what colleagues are doing and highlight this. Survey students – what do they want their learning to be like? If they could change one thing in the classroom to help them learn better, what would it be? Where do we go right? Where do we go wrong? What are the skills we think we are teaching our students, and what skills do they think they’re learning? If there is a disconnect, why is this so? How can we change that? Very fun stuff to think about. Ultimately about being a better teacher and therefore achieving better outcomes for our students. This is why we went into teaching in the first place. Love it. How can I get on an educational tour? 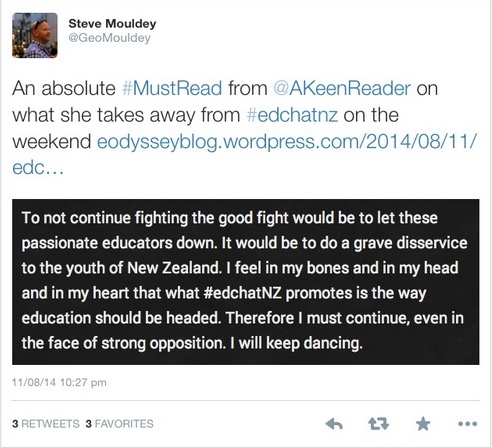 To do some reading/thinking/learning about collaboration – lots about this at ULearn. Really clear that change must be driven from the top, or at least with significant and positive support from the top. This must be tangibly realised in the form of time and money, e.g. PLD. We must build inquiry model into teacher appraisal. Concept of connectivity and collaboration – implications for students and the classroom. What do we already do that helps promote collaboration? Group work, literacy circles…how can technology help us do this further? Implications for assessment too. Interweaving future focused learning and NCEA. Choice, asking students what they want to learn, which texts to study from this range that I have knowledge of? Lots of sites to check out, but priorities are: joining the virtual learning website, and checking out the elearning framework. Also would like to find and read the 2012 research she referred to. She offered to have a coffee sometime – a great network contact to have, who knows the Marsden context. Smart suggestion – what opportunities does the ‘new’ creativity centre off us as a future learning space? Embarrassingly, hadn’t even considered it myself! Activity to try: Flickr visual concept. In summary, she really emphasised the same threads of the conference – knowing why you’re doing something, it’s about learning design to meet student needs, not about the “shiny things”.